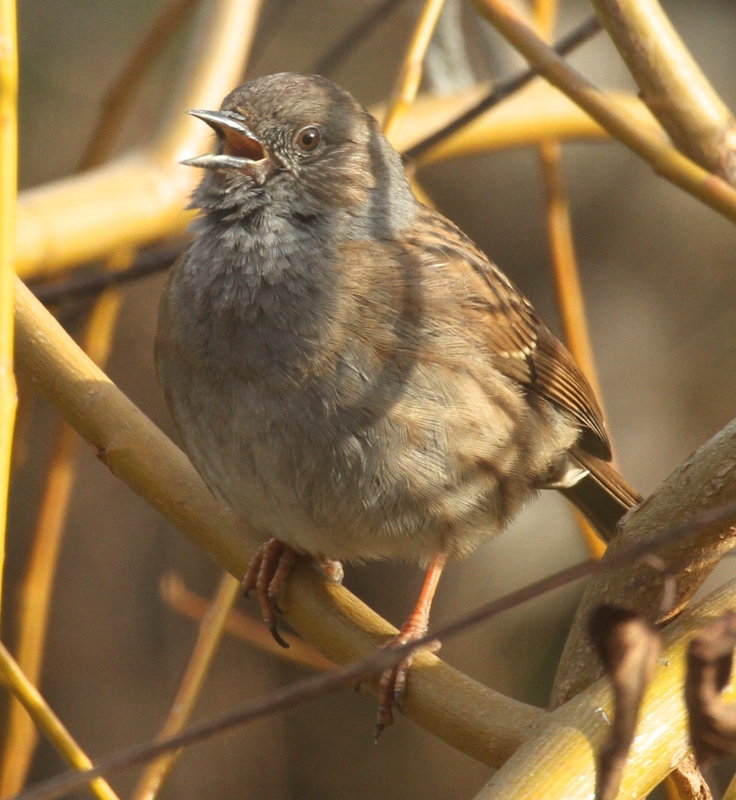 flying low, so now is a good time to get to know it, as it sings it’s attractive song from posts or shrubs. 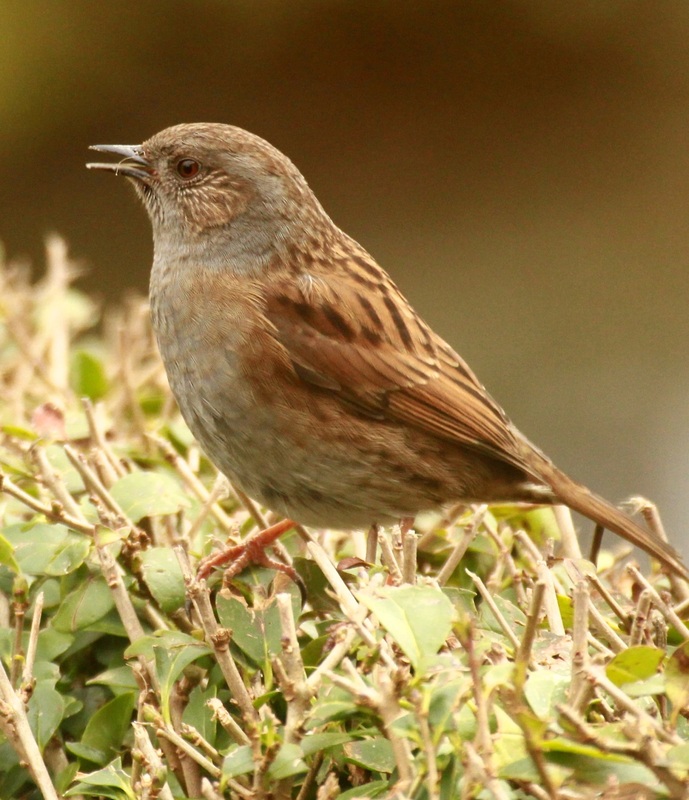 Whilst some male Dunnocks are monogamous, others behave unusually in their bid to fertilise as many females in their territory as possible and can even be seen pecking the sperm of other males from the cloaca of a female. 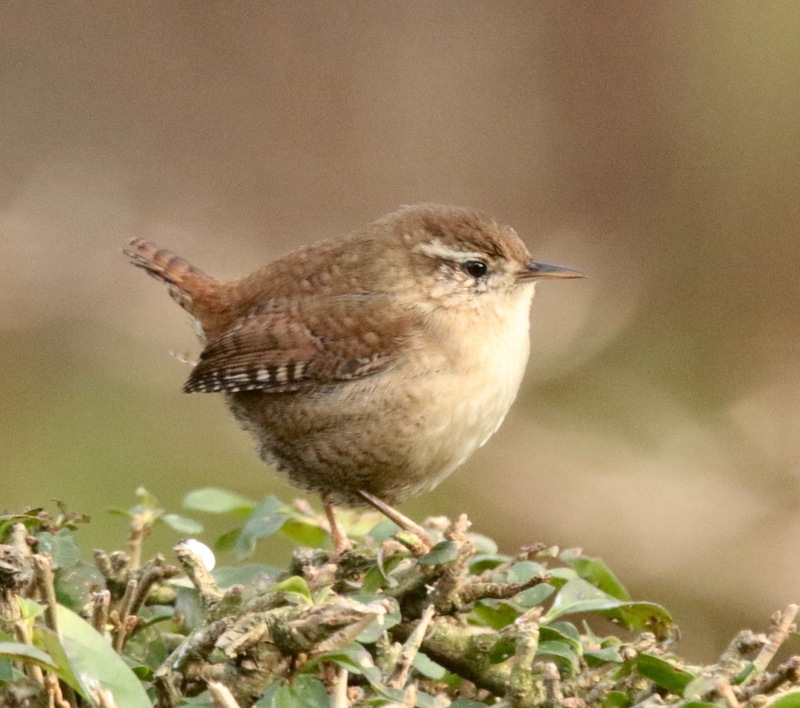 Young in the same nest have been found to have been fertilised by different males. Conditions: Cool, sunshine and showers. Temperature: Max 10 Min 3c. 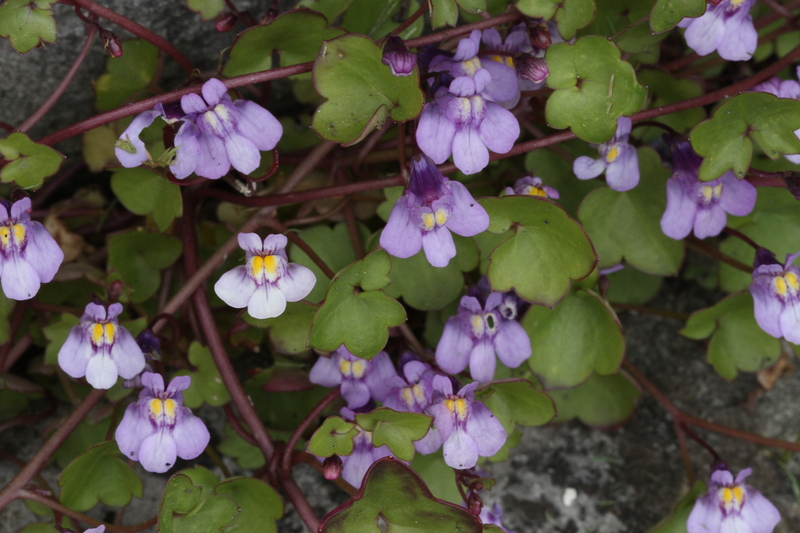 Ivy Leaved Toadflax, or Cymbalaria “runneth and spreadeth on the ground and clymeth and hangeth on walls…the branches are verie small round and smooth, limmer and pliant”- a perfect description by John Goodyear, a 17th century botanist. The seeds are thought to have arrived on marble sculptures imported to Oxford from Italy. 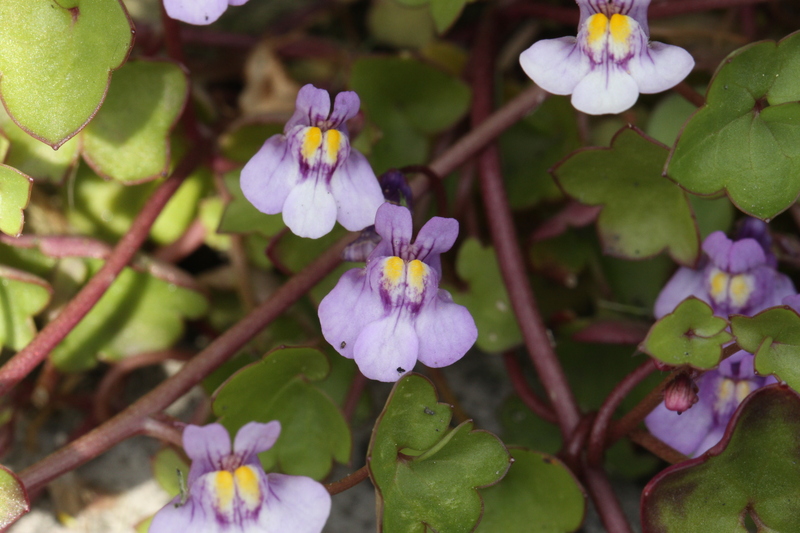 The edible leaves taste watercressy. Conditions: chilly and cloudy after rain. Temperature: Max 11 Min 5c. 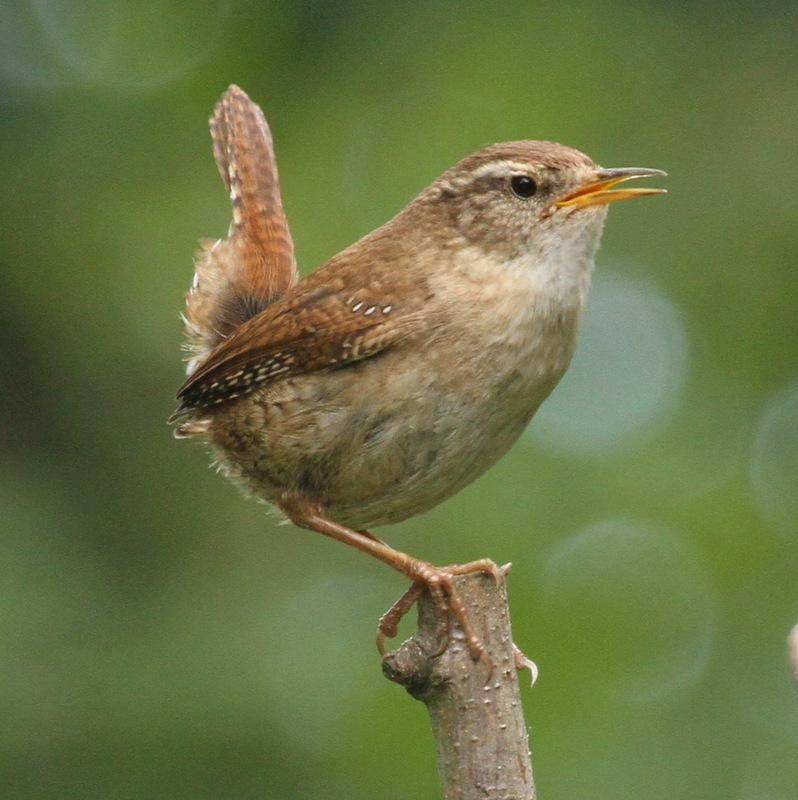 A male Wren has been singing its heart out from dawn till dusk, in the garden, and as the most common UK breeding bird, chances are there is one near you, too, so, if you don’t know it, it is a great time to learn its powerful, long song (RSPB website to hear it). 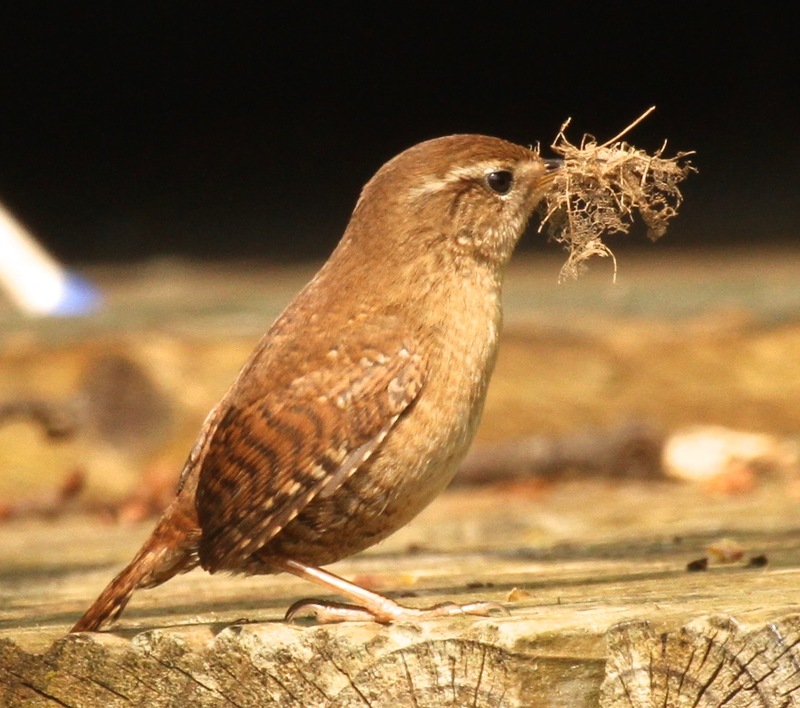 Unlike most birds, they make several nests. 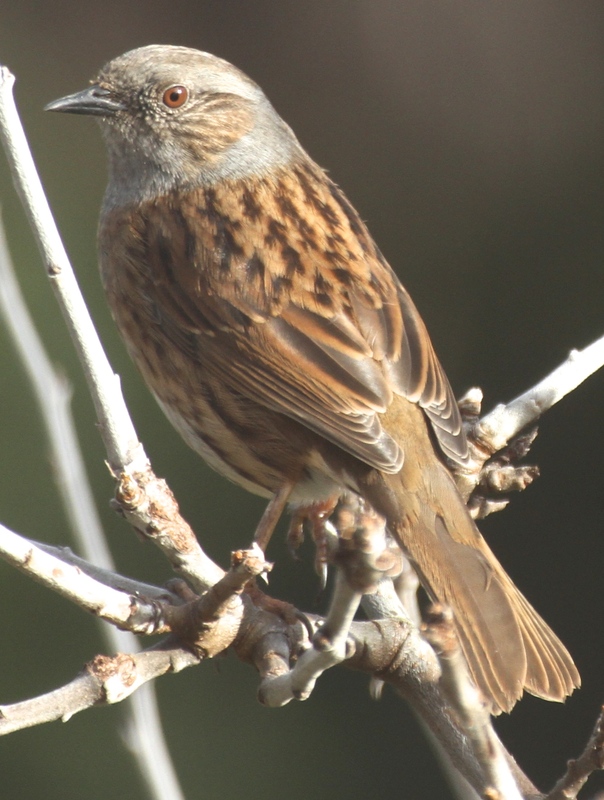 They sing to hold a territory and to attract a female, which the male will then show round its nests. With luck, she will choose one and they will breed. 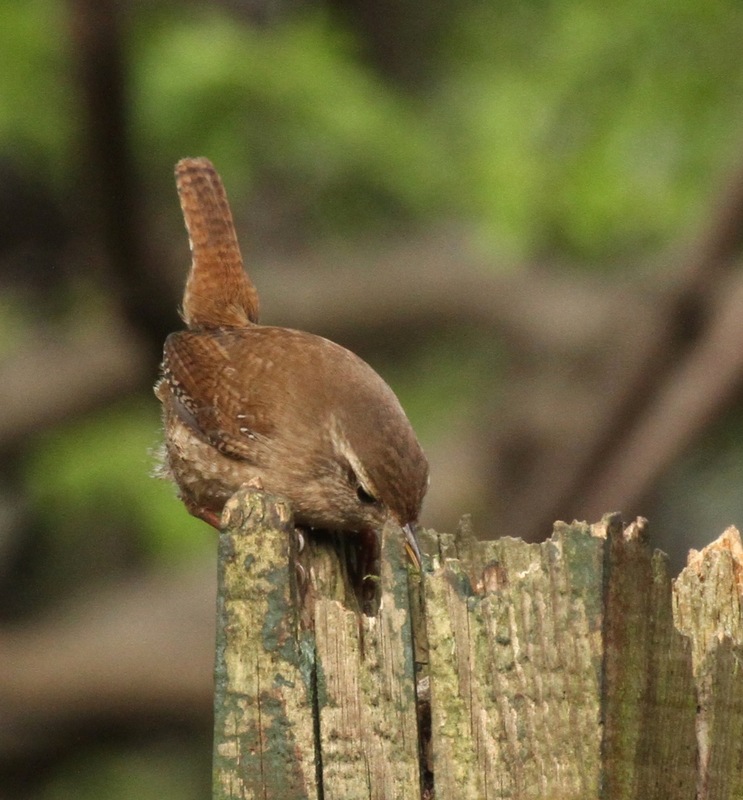 Sometimes the male will also attract another female to one of its other nests, when it will be even busier tending to both. Conditions: Showers and sunny spells. 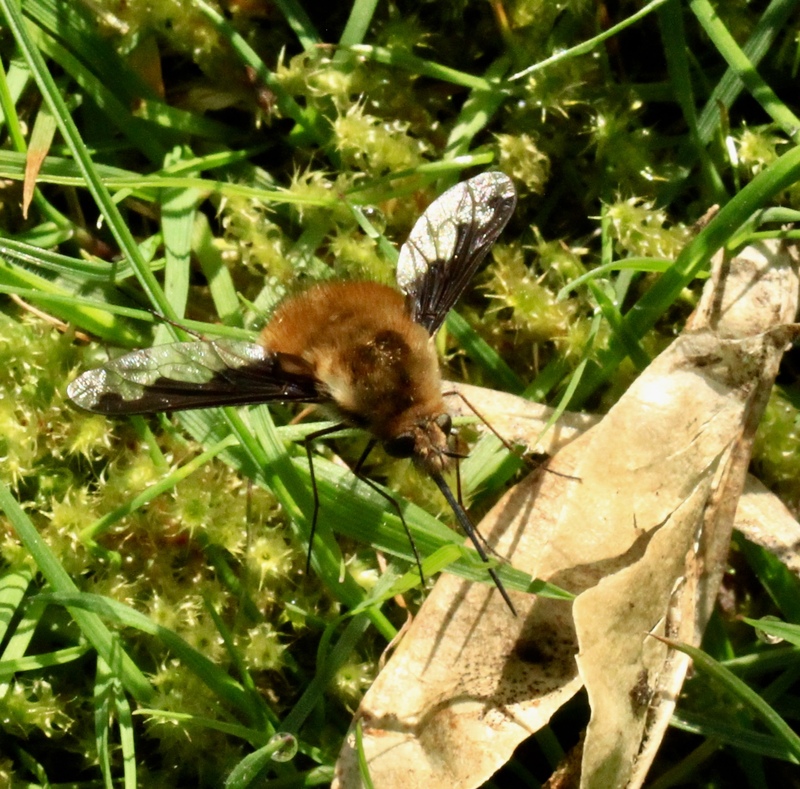 Temperature: Max 12 Min 5 C.
Lots of wondrous Dark-edged Bee Flies in the garden and area at present. 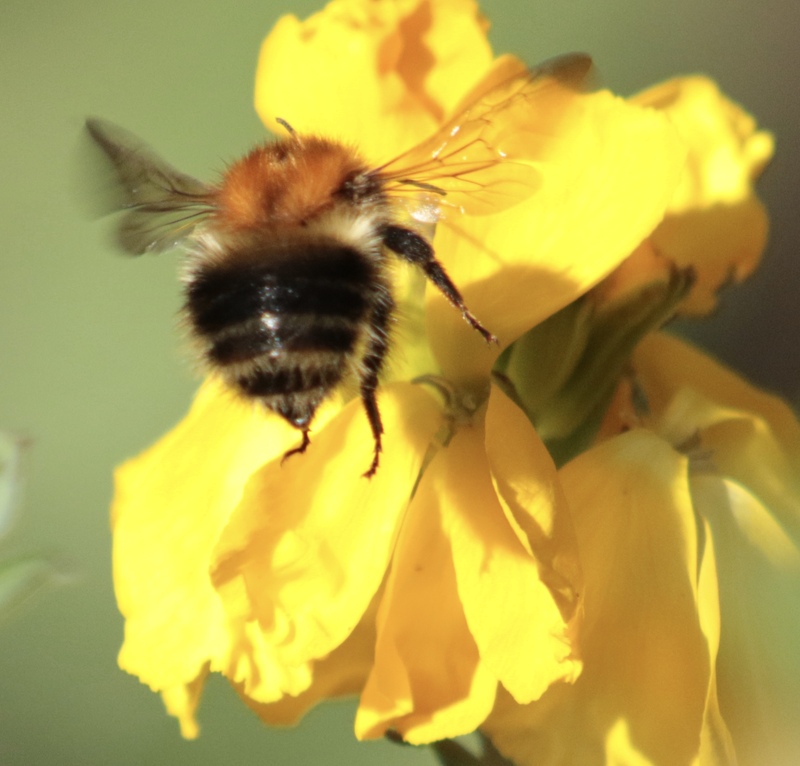 These gingery mimics of Bees are completely harmless to us and use their long probosces to sup nectar, often while hovering near the Primroses, Forget-me-nots etc they feed from. 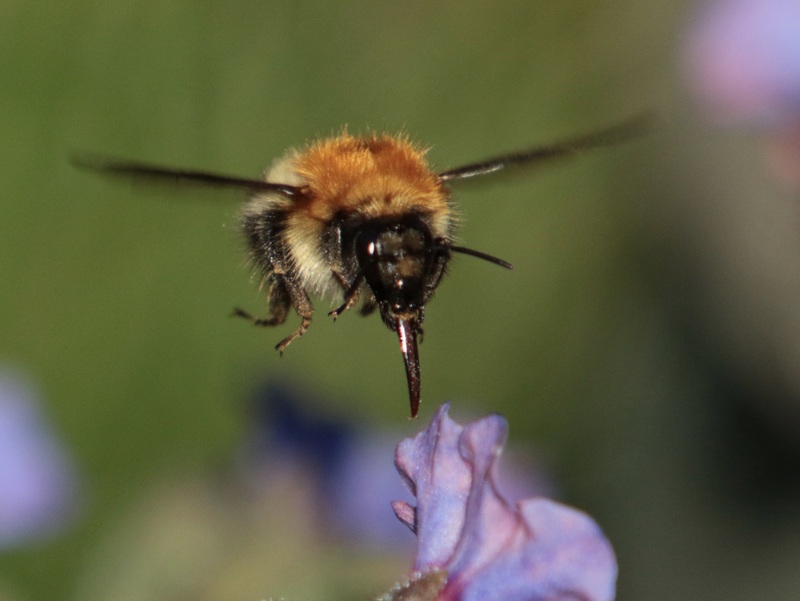 However they are harmful to ground-nesting Bumble Bees. 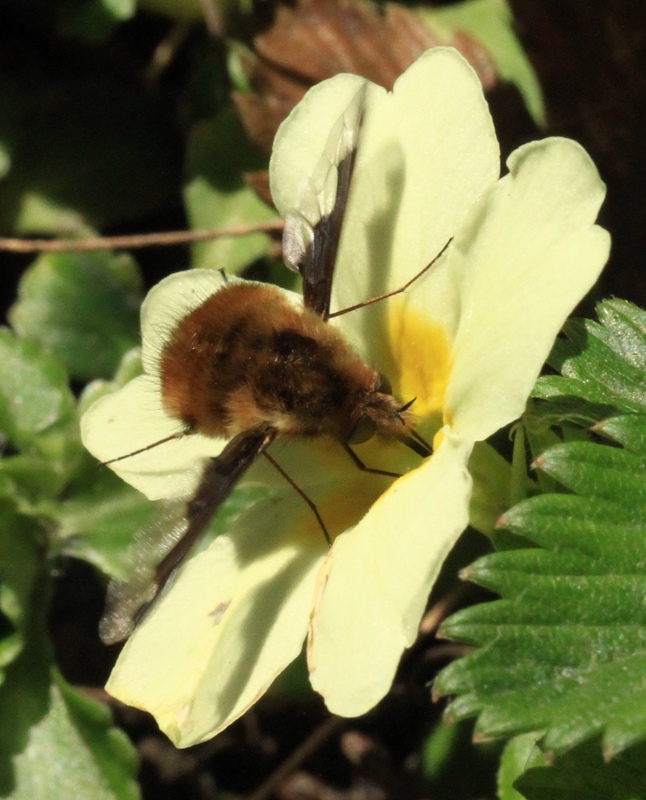 Bee Flies roll their eggs in sand or dust, maybe to camouflage them or to make them heavier, fly low over the ground searching out Bumblebee nests, and flick the eggs into the nest- holes, where they hatch and parasitise the Bees’ larvae. 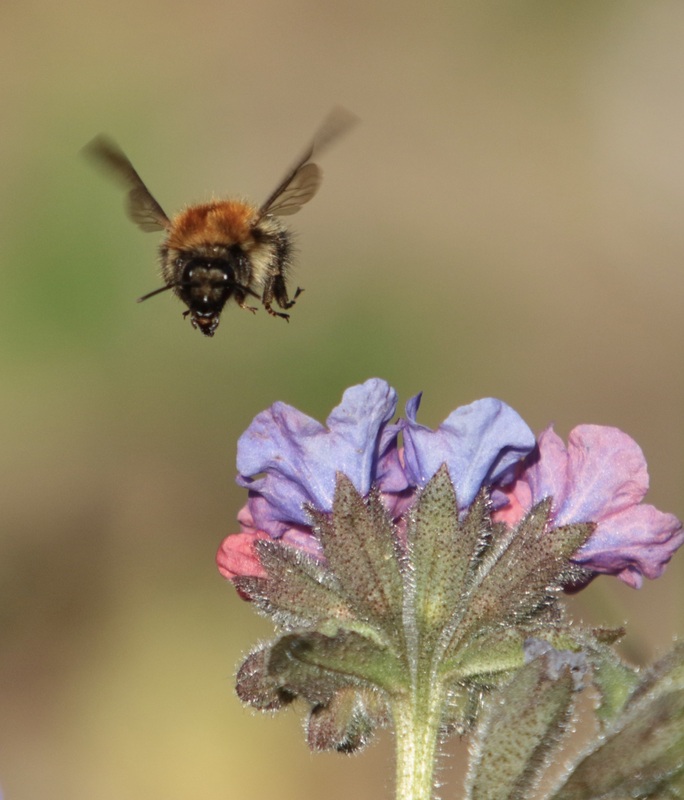 You may spot Bee Flies hovering a few feet above the ground, looking out for nests to parasitise, changing direction at vast speeds, only to hover again. Conditions: cooler with cloud and sunny intervals. 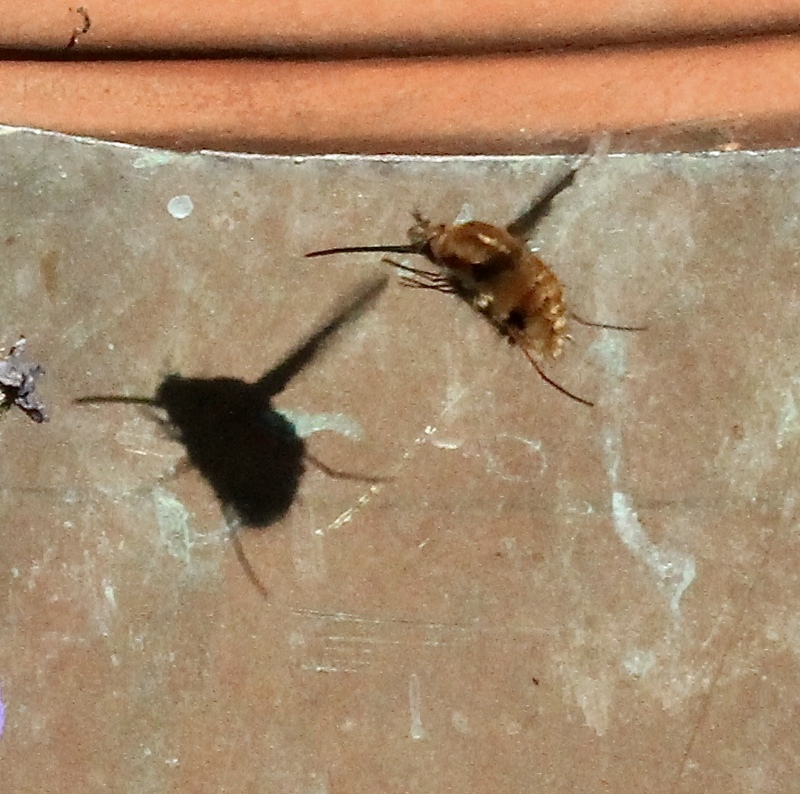 Temperature: Max 14 Min 10 c.
ginger thorax and they are loving our Pulmonaria and Wallflowers right now. 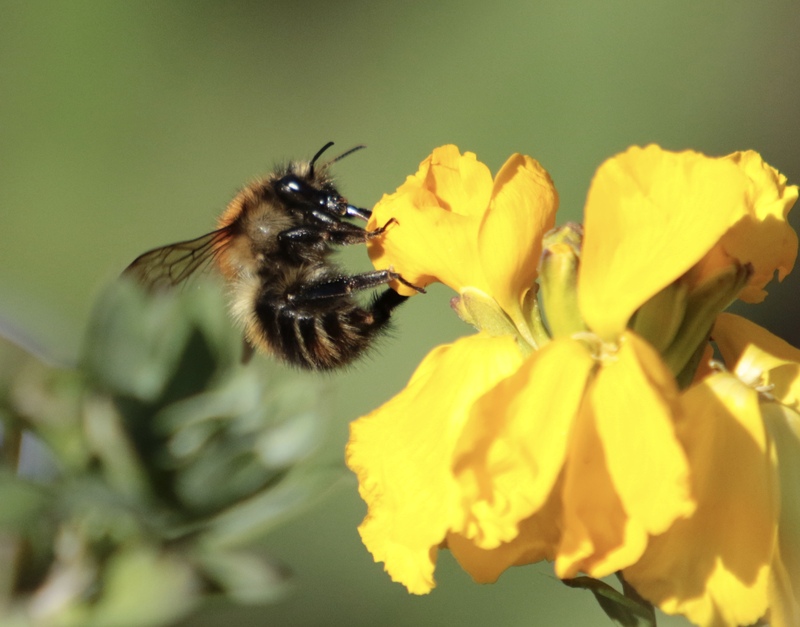 They aren’t very big and they get their name from their habit of combing (carding) material to cover their larvae. Conditions: still this unseasonally hot, sunny weather spell. Temperature: Max 23 Min 12c. 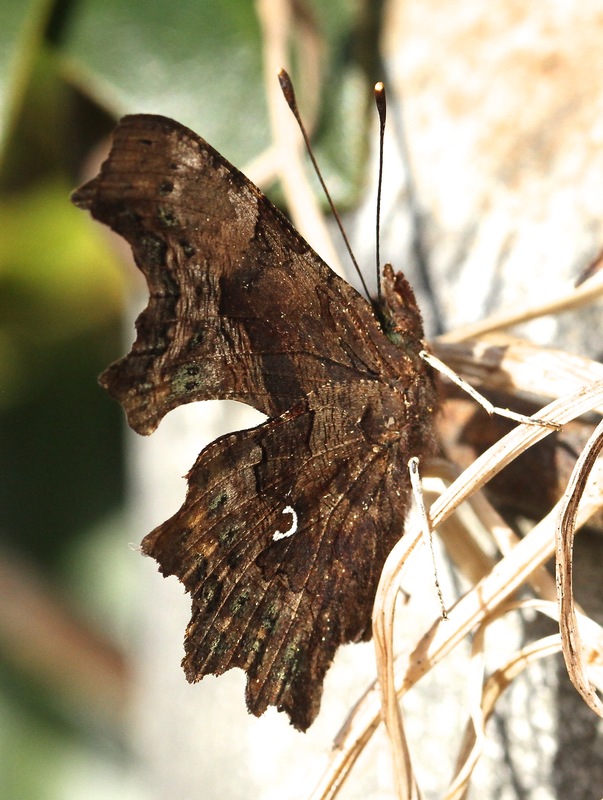 The beautiful and easy to identify Comma butterfly, one of the few UK Butterflies to overwinter as adults, was warming up in today’s sun. 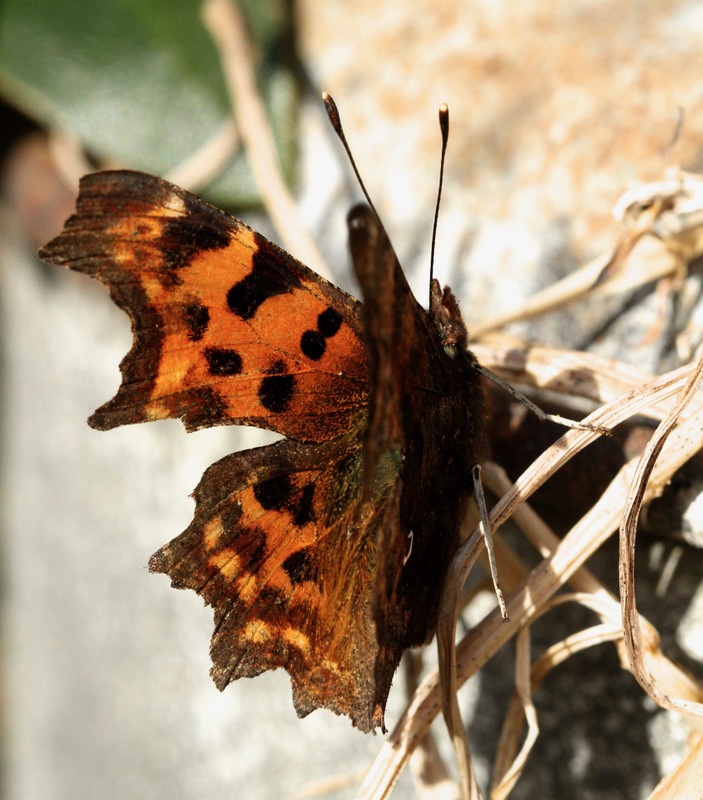 The Comma is also one of the few UK butterflies whose populations are on the rise, although after a severe decline that was probably due to the reduction of hops being grown, (a favourite food-plant of the Comma caterpillar, which also eat nettles). 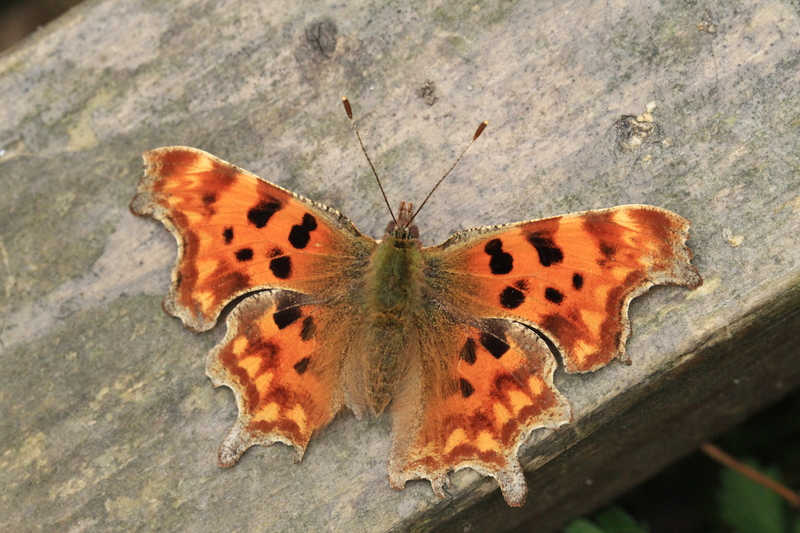 If you don’t know why it is called a Comma, look at the photo of it with its wings folded. Conditions: Cloud clearing to hot sun. Temperature: Max 20 Min 11C. 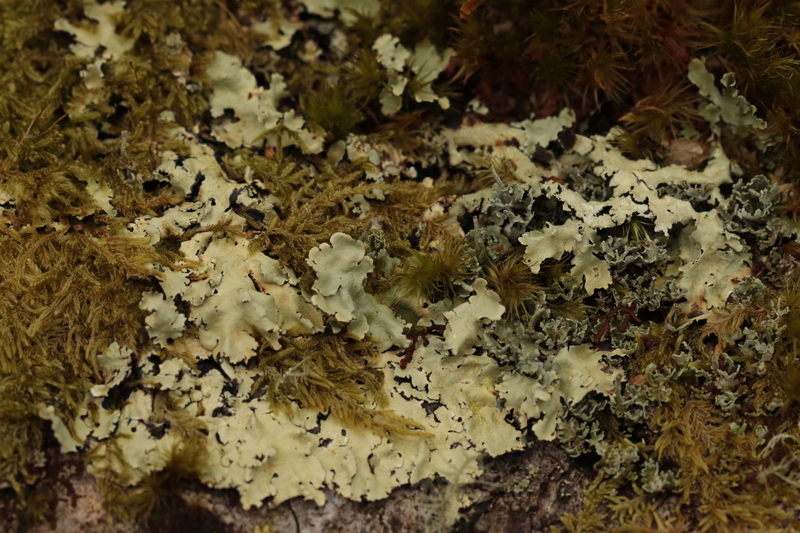 Some colonies of Lichen are over 8,000 years old and we have at least 1,700 species in the UK, so the British Lichen Society’s ‘Next Steps Project’ which aims at helping the non-plussed like me to identify common species is really worth logging onto. 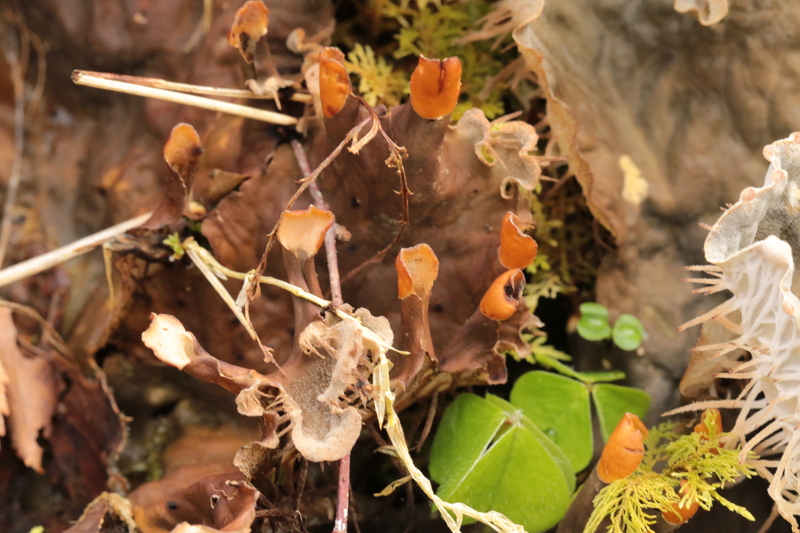 I think these, from Coed Lletywalter, are from the Peltigera (leafy) and Parmelia family. 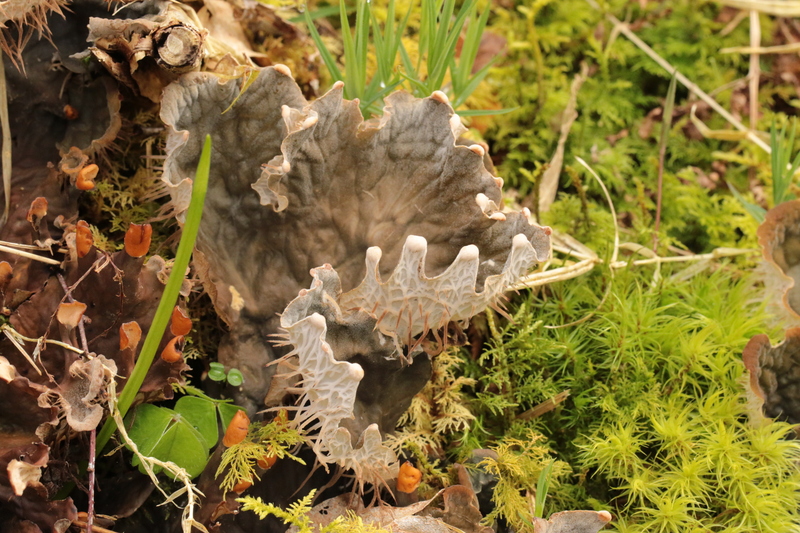 A symbiotic relationship between fungi and algae, Lichens extract water and nutrients from the air, which is why they are a good indicator of air quality– in this NW Wales ancient wood they proliferate on bark, stone and ground. Conditions: Plenty of sun with a cool breeze. Temperature: Max 14 Min 9C.